During the Cold War that began after World War II, the United States was bitterly engaged with the then Soviet Union in a battle that was not as much about fighting but about a conflict between political and economic ideologies. The United States, a capitalist power, and the Soviet Union, a communist power, were trying to prove the superiority of each respective system on the world stage. Both sides felt that the one who made the most advancement in the field of space exploration would gain a major advantage in the conflict. At the end of the war, the Americans, the British, and the Soviets all competed for access to the rockets that the Germans were working on and worked to bring over German scientists to their countries. One such scientist, the brilliant but controversial Wernher von Braun, became a citizen of the United States in 1955 and was the lead rocket engineer for the U.S. in the 1950s and 60s. The rockets were to be used to launch objects into space. Despite von Braun and his team's efforts at research, the Soviet Union was the first country to launch a satellite into space in 1957. The Sputnik 1 reached near earth orbit on October 4th of that year. In November, the Soviet Union launched Sputnik 2, this time passengered by a dog named Laika. Laika, sadly, was not launched with the intention of being brought back to earth. She died a few hours after being put into orbit, but the mission was proclaimed as a success by the Soviet media at the time. Soviet scientists wanted to study the effects of weightlessness and orbit on a living creature in preparation for manned flights into space (Laika is now memorialized by a statue in Moscow and has a spot on the planet Mars named after her). Three months after these first Sputnik missions, the U.S. launched Explorer 1, its first passenger-less satellite to reach orbit. Launching satellites was obviously a feat of great technical importance and a milestone for all of human civilization, but the next goal was the successful launch and return of a human into space. Again the Soviets were first, launching Yuri Gagarin into orbit on April 12, 1961. 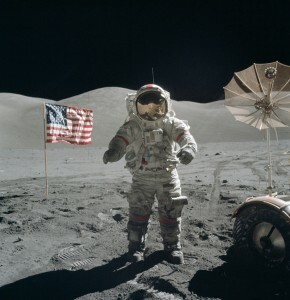 The U.S. was desperate to catch up and the next month, U.S. President John F. Kennedy gave a famous speech calling on the U.S. Congress to commit to space exploration and land a man on the moon. In February of 1962, the U.S. launched their first man into orbit, astronaut John Glenn. He was heralded as a hero, but all eyes were on the moon. The Apollo program, the U.S. plan to launch a man to the moon, was fully underway by the end of 1962. The Apollo mission saw a major setback in 1967 with the death of three crew members, but on July 20,1969, American astronaut Neil Armstrong was the first man to set foot on the moon. The 1970s saw several more American trips to the moon. The Soviets shortly gave up on the moon and instead decided to focus on launching a space station in orbit, which they did with the Salyut 1, beginning the era of space station exploration that continues to this day. Bitter antagonism and political posturing fueled the Space Race, but it was a positive boon for scientific understanding. Our planet as a whole saw significant advancements in technology and the understanding of our universe as a result of space exploration. Many people continue to argue today for increased attention and funding of science and research, but without a strong political agenda, it is difficult to find increased funding for space. The hope is that by creating the goal of future space exploration to other parts of our solar system, including Mars, we can engage in the kind of research and invention that drives our technological society forward.